The Mullet Creek area of the Indian River Lagoon has been teeming with Manatee this winter. With the warmer than average winter temperatures here in Central Florida, the water temperature in this area of the lagoon has stayed above 70 degrees, keeping a manatee population in the area to enjoy. 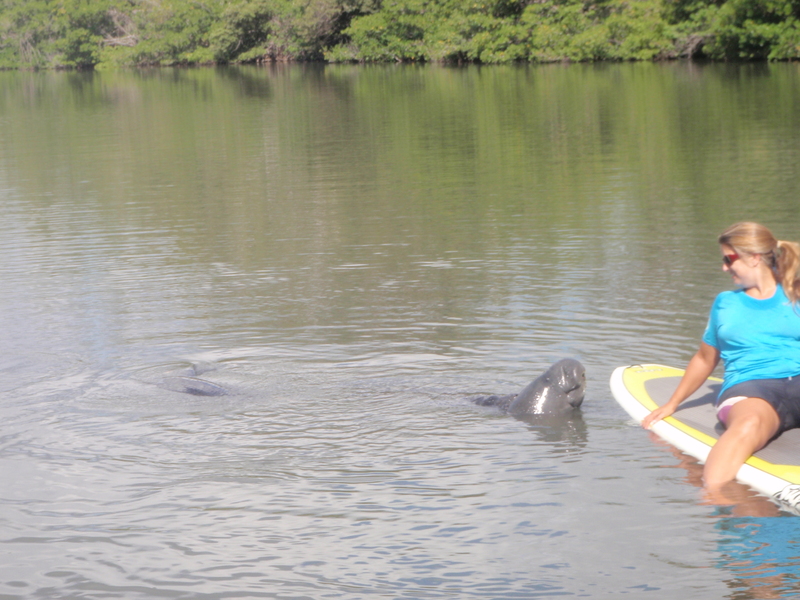 Fernando Ontiveros, owner and guide for SUP Eco Adventures, the stand up paddle board company in Melbourne Beach, FL, says that seasoned stand up paddlers and first time guests on the eco tour have been thrilled with the abundance of both manatee and dolphin in the area. Stand Up Paddle boarding, is a great eco-friendly way to enjoy the natural environment that we have here on the Space Coast and allows visitors to experience manatee and dolphin in their natural state without disturbing the wildlife. Ontiveros states that many of the guests on his Eco tours are from Vero Beach and cocoa beach and are amazed at the relative solitude and unspoiled beauty of this area. Many visitors enjoy the nightlife and restaurants of Cocoa Beach, but are thrilled to find that just a short drive south allows them to paddle in an area that is much less congested than the tourist town. 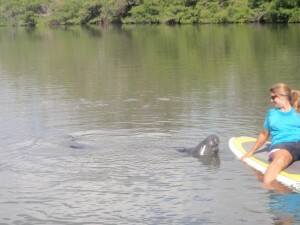 They are thrilled to be able to enjoy the manatee population without having to share the experience with dozens of others are without having to worry about boaters scaring them away. Dolphins swimming, jumping, and fishing alongside manatees nibbling on the mangroves is truly a reason to spend time on the waterways in sunny Central Florida. No need to wait for summer….it’s all here to enjoy right now this winter! This entry was posted on February 17, 2013. It was filed under SUP Blog and was tagged with adventure, cocoa beach, dolphin, fun, melbourne beach, stand up paddle boarding, sup, vero beach.